If you’re unfamiliar with Skipton, it’s a little market town at the gateway to the Yorkshire Dales. I’ve lived here for thirteen years and I’m very proud of my adopted home town. 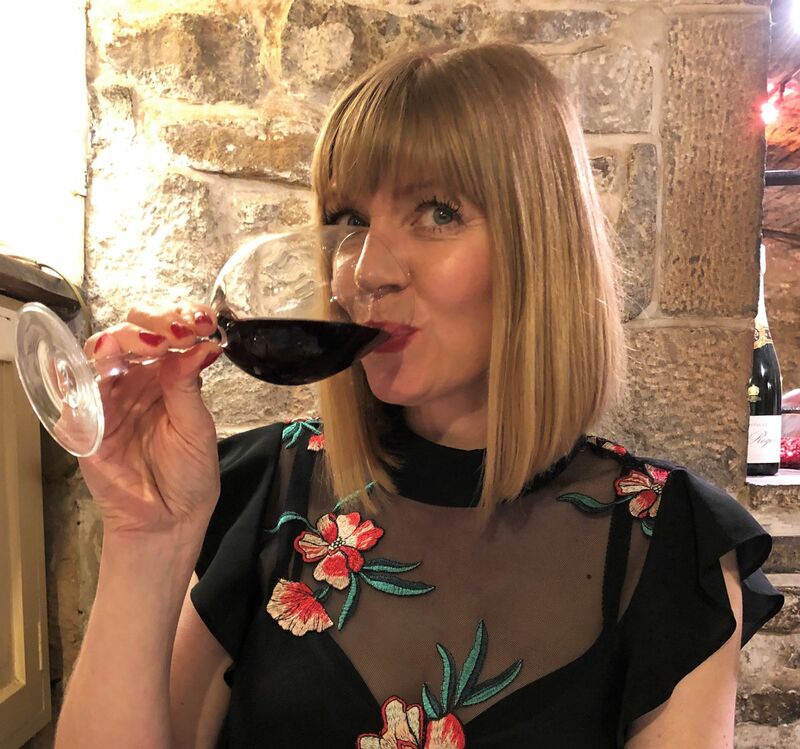 Throughout that time, a number of new restaurants, bars and eateries have opened up which alongside well-established eateries, serve to make Skipton highly desirable for visitors and locals alike. We’re fortunate to have so much choice on the doorstep. 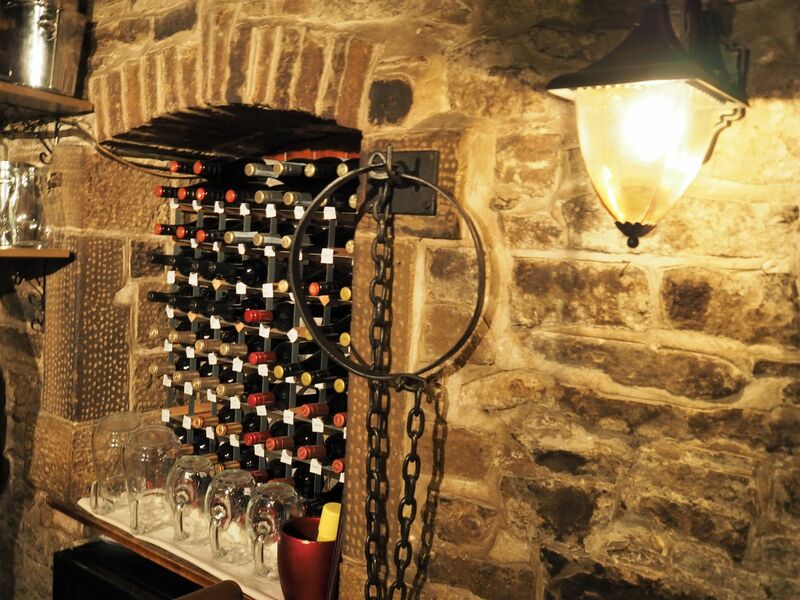 Le Caveau is our go-to place for special occasions though. We’ve been for Valentine’s day and for birthdays and we’ve been to the annual lobster festival. This gem of a restaurant has been here for over sixty years and the current owners Mark and Esther Byron took over in 2014. It sits below street level on Skipton High Street and is small and cosy with a fascinating history. It started life in the 16th century as a prison for Craven District’s felons and sheep rustlers. The interior has an abundance of authentic character with low vaulted ceilings, beams and exposed stonework. 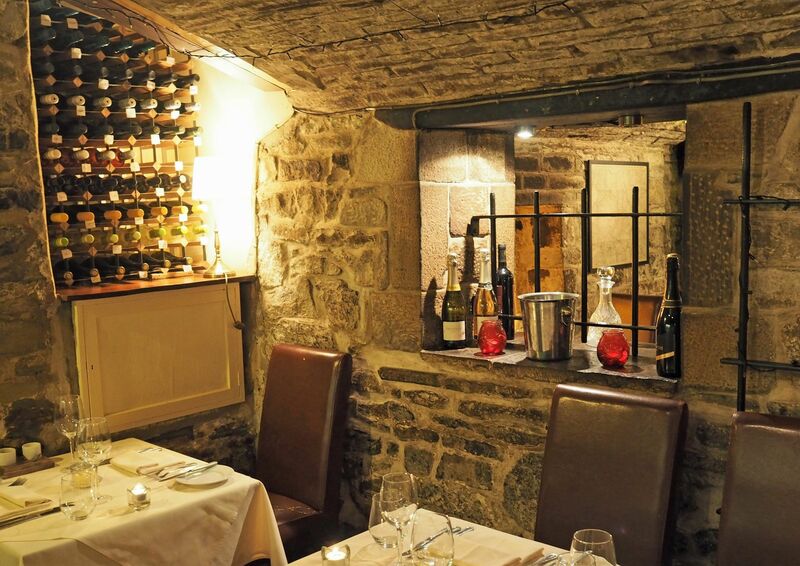 Le Caveau is a small and cosy restaurant which seats about 22 guests. I hope you can see from the photographs just how characterful and unique it is. It always has a lovely atmosphere and it’s intimate, (just enough), without being intrusive. 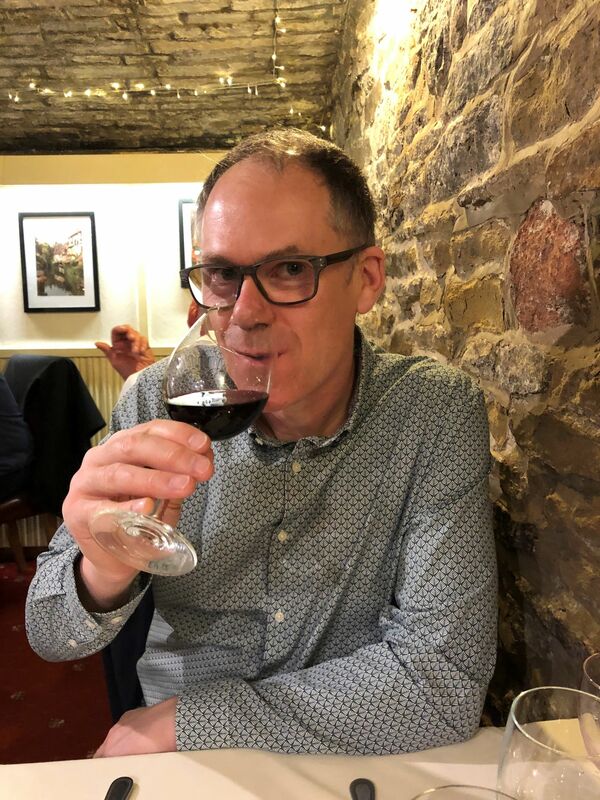 On Friday night, Ian and I went to the April taster evening, six courses each matched with a different wine. There is a small cosy bar area and Jaime, who looks after front-of-house, is always there to offer a warm welcome, a seat, and a pre-dinner drink. 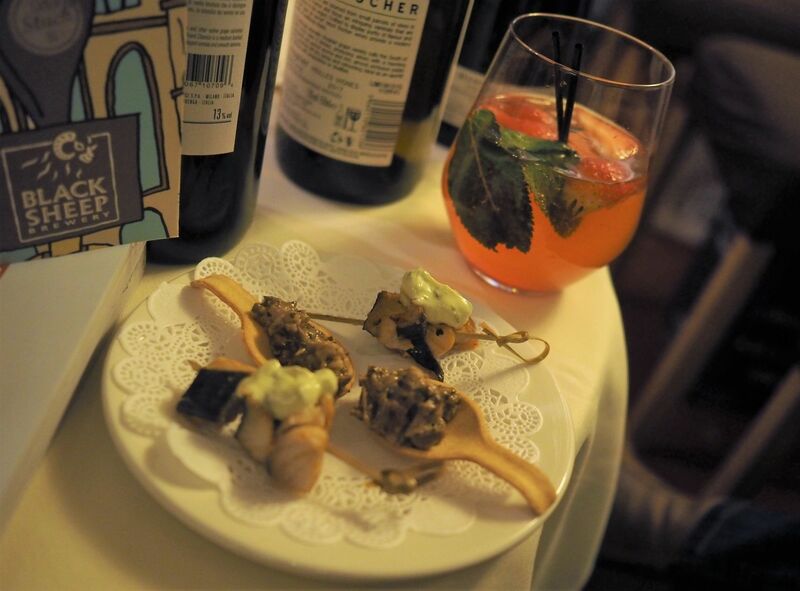 The taster evening started with a cocktail and canapes. The cocktail was pink gin with raspberry purée. It tasted like summer in a glass and is something I’ll recreate at home. 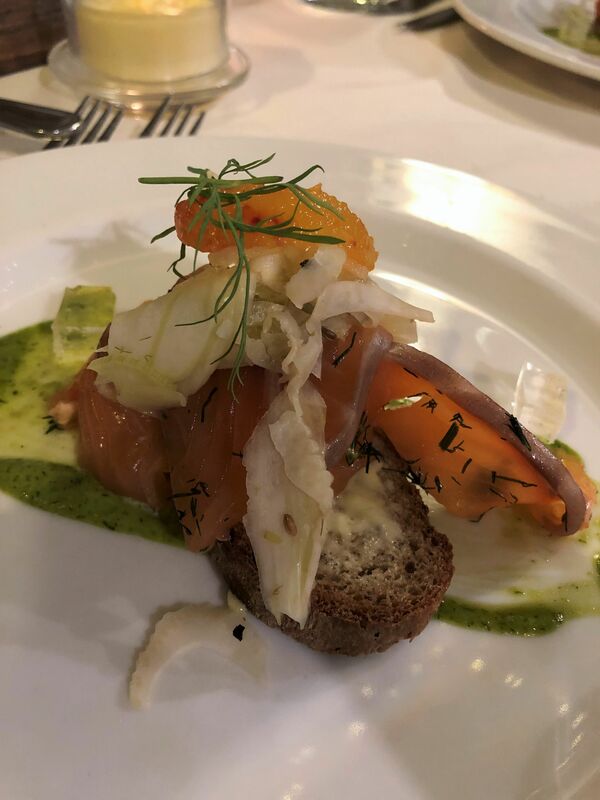 The first of the six courses was Gin Cured Gravadlax with blood orange, fennel, cucumber pickle and seeded rye. If you’ve read any of my food reviews before, you’ll know that I love fish and almost always order accordingly. Chef Mark gets all of his fish from George Wilson, “The Fish Man”, who sells at Skipton Market every Wednesday and Friday. This was, without doubt, the best fish dish I have ever eaten. The salmon itself was plump and succulent and the flavours in the gin cure and also in the accompaniments were heavenly. And can you see the little cubes of gin jelly? Divine. 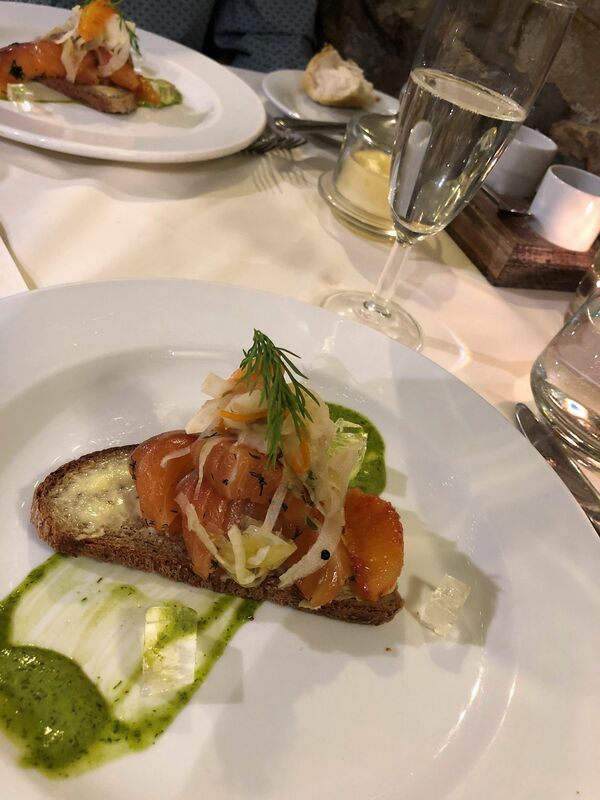 The gravadlax was paired with Mabis Prosecco. For some time now, I’ve been thinking that Prosecco has had its day. For me at least, it’s lost its sparkle. This might simply be because I have consumed too much over the last decade. 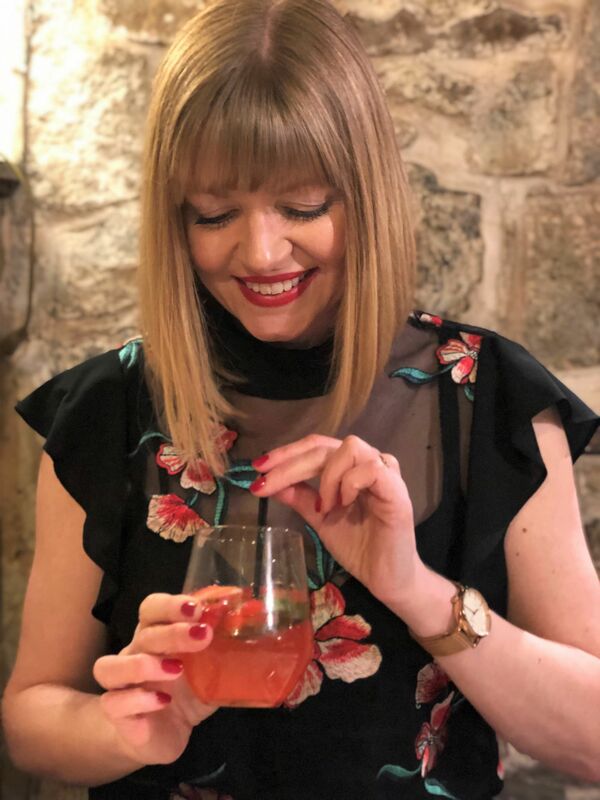 But I’d prefer to think it’s because I’ve developed a taste for Cava, which bears more similarities in taste and production to Champagne, my absolute favourite tipple. 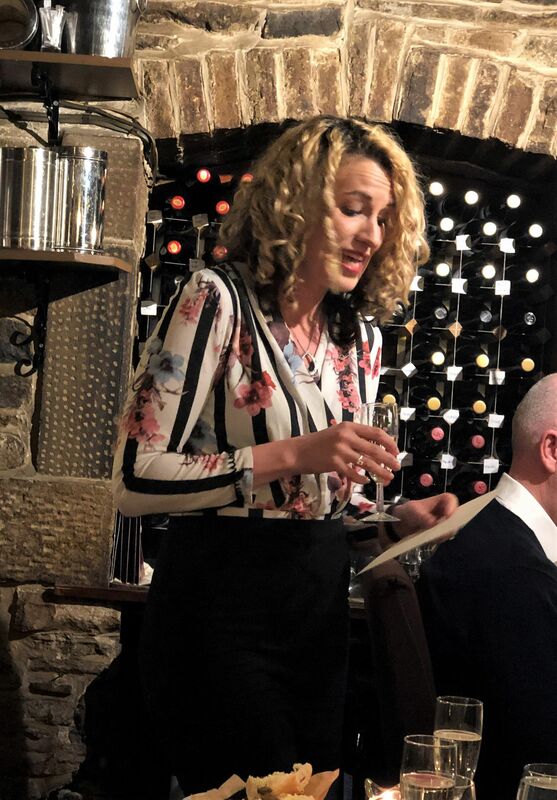 At the start of each course, Jaime delivered the wine tasting notes and I was interested to hear that Mabis Prosecco is produced in the same way as its French and Spanish cousins. The one we had was a vintage and had apple, pear and honeysuckle flavours. I’m going to reignite my love affair with Prosecco because as well as being perfect with the gravadlax, it was delicious. The second course was homemade fruity black pudding, cinnamon and pineapple jam doughnut and chilli oil. 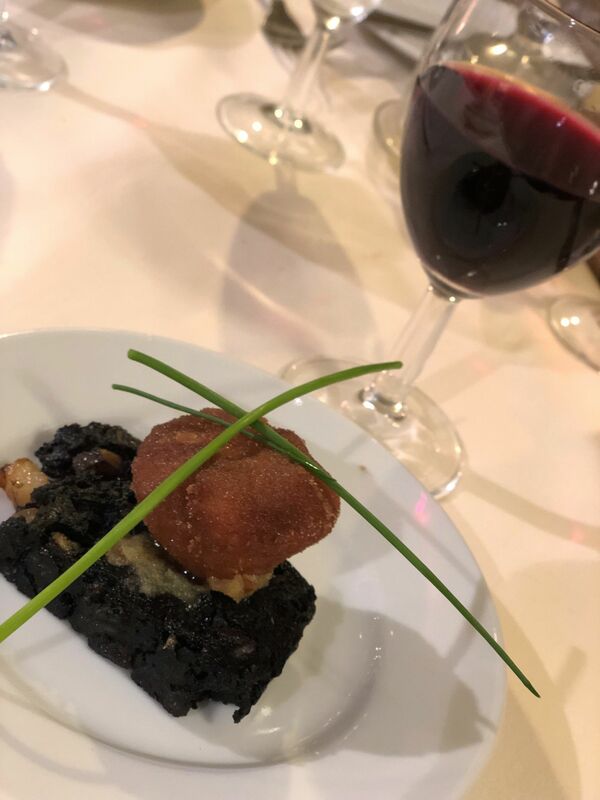 Black pudding isn’t something I’ve had much of previously. The dry, rather plastic-y looking black discs so ubiquitous at hotel breakfasts have never whetted my appetite. This on the other hand was a feast for the eyes as well as the taste buds. The fruit content in Mark’s homemade version made it look and smell like Christmas pudding. It was tasty and moist and it crumbled beautifully. The doughnut was the best I have ever tasted and I hope that Mark will include them in his dessert menu sometime soon. The ingenious combination of savoury and sweet was a marriage made in heaven and of all of the courses, this was the most unusual and probably the biggest surprise. 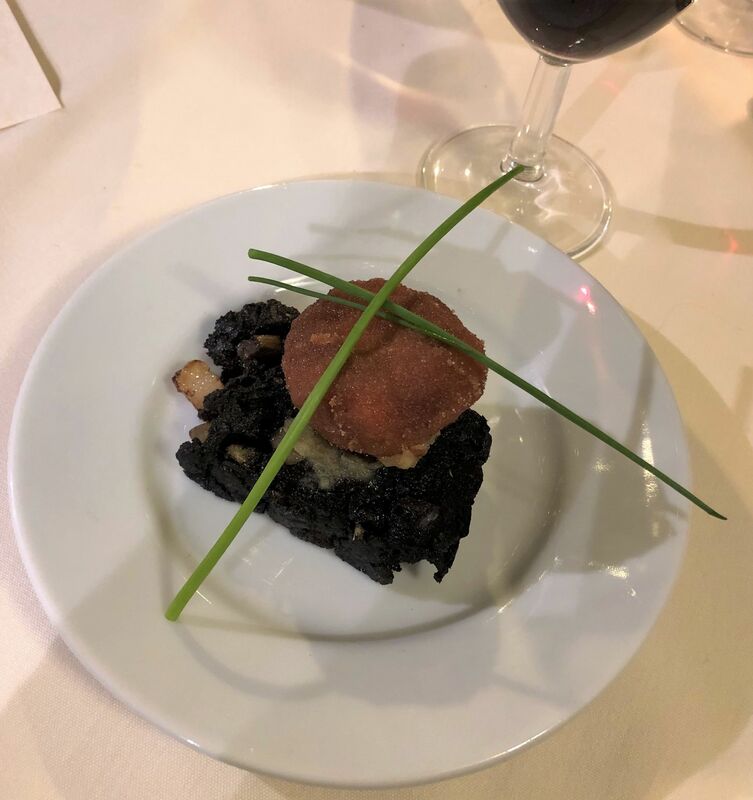 The wine pairing was a Beaujolais, “Fleurie La Reine de L’Arenite.” The tasting notes said it had a heady perfume of freshly picked irises and peonies above the crushed berry fruit nose. Ripe tannins and fresh acidity support a palate of Morello cherries and bitter dark chocolate (reminiscent of a Black Forest Gâteau). I have to admit to being unable to taste or smell either irises or peonies, but the cherry was unmistakable. The perfect partner to the fruity black pudding. 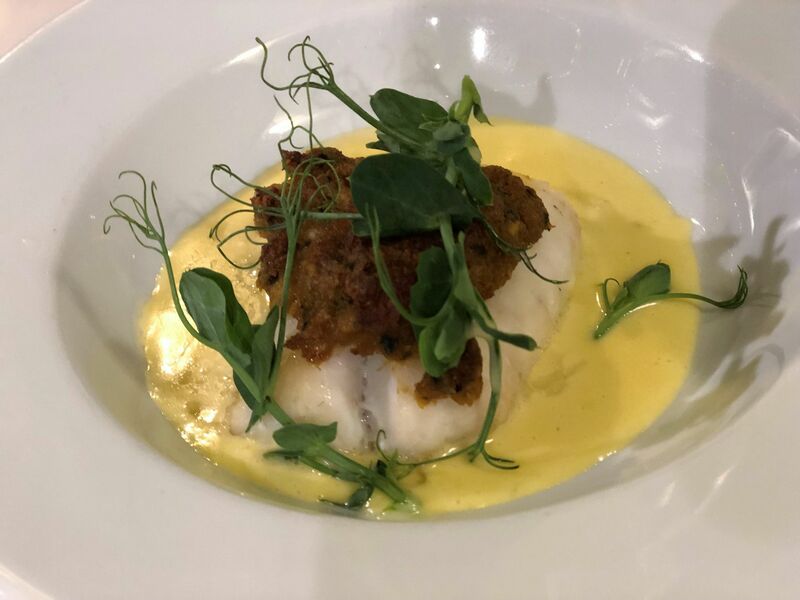 I was never in any doubt that the Crab-Crusted Silver Hake with saffron and lemon velouté would be perfectly executed. 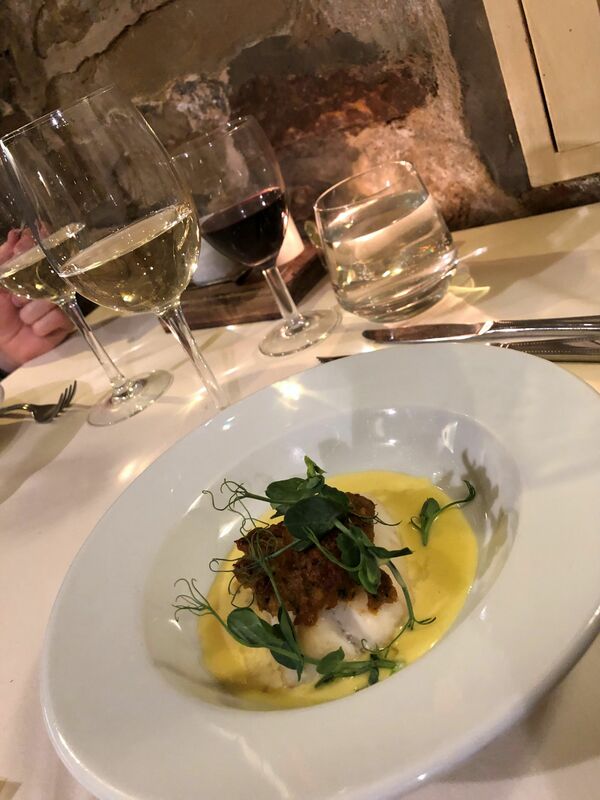 Le Caveau could never disappoint with fish. This hake was melt-in-the-mouth-tender, yet the crab-crust was, well, crusty. The contrast in texture alongside the velvety velouté made this a dish to savour. And who can resist a pea shoot garnish? This wine pairing was Mont Rocher Viognier. Viognier ranks among the top favourite whites for both Ian and me, so we knew that this would delight. We found it particularly interesting to learn that this very aromatic Viognier produces its aromas at a certain stage of maturation. so the winemaker tastes the grapes every day in August, in order to choose the exact right time to harvest. This wine’s apricot and nectarine flavours and smooth buttery finish went beautifully with the hake. 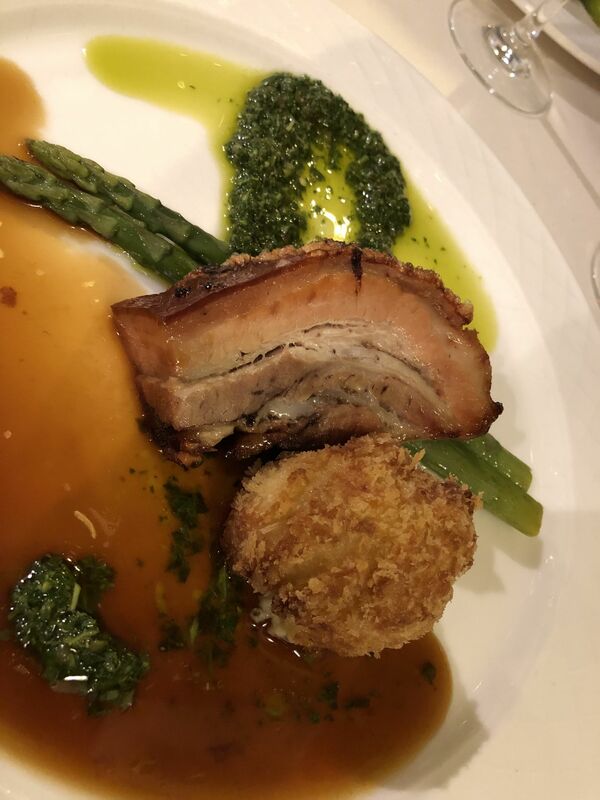 Next was 12-Hour Slow-Roasted Rare Breed Tamworth Pork Belly with honey and Dijon mustard pomme dauphine and salsa verde. I’m reluctant to eat pork because all too often it is too fatty to enjoy. But this was lovely. The fat melted into the meat which along with the crispy, crunchy crackling, made the most flavoursome and fulfilling mouthful. The pomme dauphine was perfect as we expected; honey and mustard are always happy when teamed with pork. The salsa verde was zingy and refreshing and it looked spectacular on the plate. The accompanying wine was a San Felice Chianti Classico. The notes describe it as a generous, lifted, spicy nose, with cranberry fruit characters and a hint of cedar. 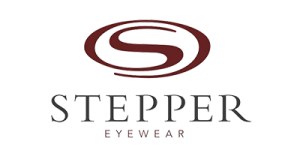 The palate has fresh red cherry flavours and fine, polished tannins – showing depth and good integration along with ripe red fruits and a long supple finish. It was perfect with the pork. It’s (understandably), a little-known fact that I have, on more than one occasion, eaten three Cadbury’s Creme Eggs. Consecutively I hasten to add. Not concurrently. I have a large mouth but even I’d struggle to fit three in. 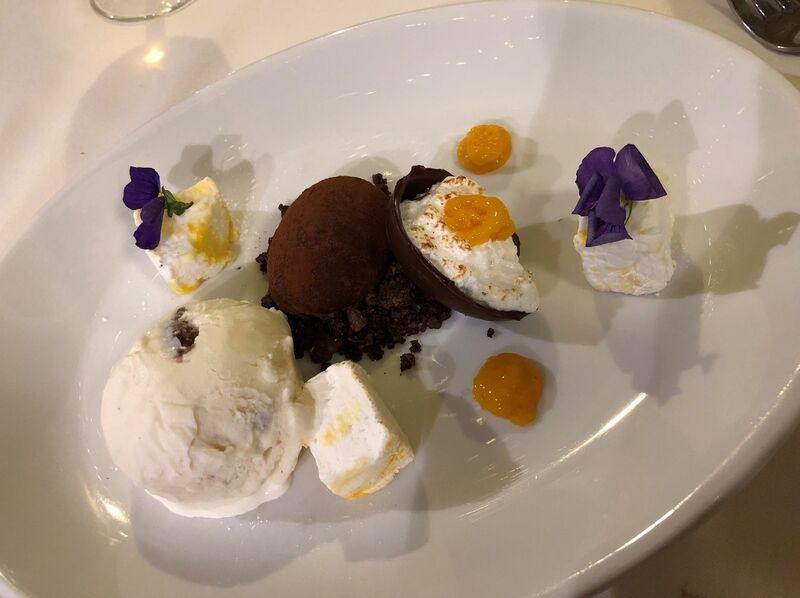 So, when I saw that pudding course was Cream Egg Truffle with marshmallow, Mini Egg ice cream, chocolate soil and mango gel, I could barely wait. The Le Caveau version was the ultimate, sophisticated interpretation of this Easter favourite. The egg comprised two halves. One was the most decadent, divine, solid, bitter chocolate truffle (you can see it on top of the chocolate soil). The other was meringue with a mango “yolk.” The homemade marshmallow was light and fluffy and just a little bit sticky. Utterly sublime. A fabulously executed pudding with an equal measure of finesse and fun. It was unforgettable and completely in keeping with Mark’s seasonal cooking. A sweet course needs a sweet wine. We had Bianchi Late Harvest Semillon. This Argentinian wine has a rich golden colour with inviting perfumes of honey, citrus peel and stone fruits. It is full-bodied with appealing juicy fruits alongside gentle vanilla. Even the description is mouthwatering. You can imagine how well the vanilla flavours in the wine complimented the truffle and ice-cream. The cheese course was handpicked by Andy Swinscoe at award-winning Courtyard Dairy in Settle, (about 15 miles from Skipton). Ian and I adore cheese and we’re always keen to try new ones. After tasting this selection, we both said we’ll buy all three in future. 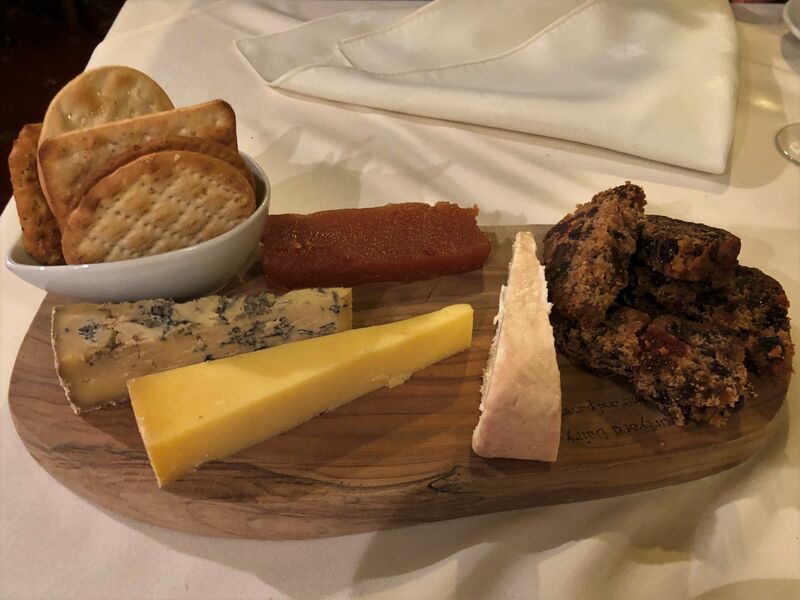 From left to right, we had Sparkenhoe Blue which looked and tasted a little like Stilton and was particularly good with the fruitcake. Next to that was the Harford Cheddar. This is what I’d call a well-rounded cheese. Medium strength, a little nutty and a little tangy. On the right was my favourite of the three, Strathearn. It reminded me somehow of French cheese: tangy and slightly soft and creamy. Very, very moreish. The last wine of the evening was a Beron Black Shiraz. This Australian Shiraz had a lovely deep colour and aromas of blackberry and plum with vanilla and spicy oak. It is full-flavoured with rich plum, blueberry and mocha notes. Perfect for cheese. It was an utter treat to eat such divine food. I honestly don’t have enough superlatives to express just how good it was. Every course was outstanding. The wine pairings added a whole new dimension and it’s something Ian and I will explore further when we cook at home and when we dine out. Each and every one of the six courses was exactly the right size and neither of us felt uncomfortably full by the end. Rather, we finished everything and felt deliciously sated and content. Six glasses of wine with a cocktail might sound like a lot, but it really didn’t seem that way. Although I could have easily had another cocktail, more Prosecco and a whole bottle of the Viognier, I felt like I’d had the right amount by the end of the evening. It was well-paced because it was one glass per course and the serving staff kept our water glasses filled too. Mark Byron is a supremely talented and passionate chef. I don’t know how Michelin stars get allocated, but I’m certain he’s worthy of one. He comes and talks to guests during every service and is always happy to chat afterwards. His right-hand woman, Front of House Jaime is brilliant too. She knows the regular guests but welcomes new visitors with as much warmth and enthusiasm. The two work extremely hard. 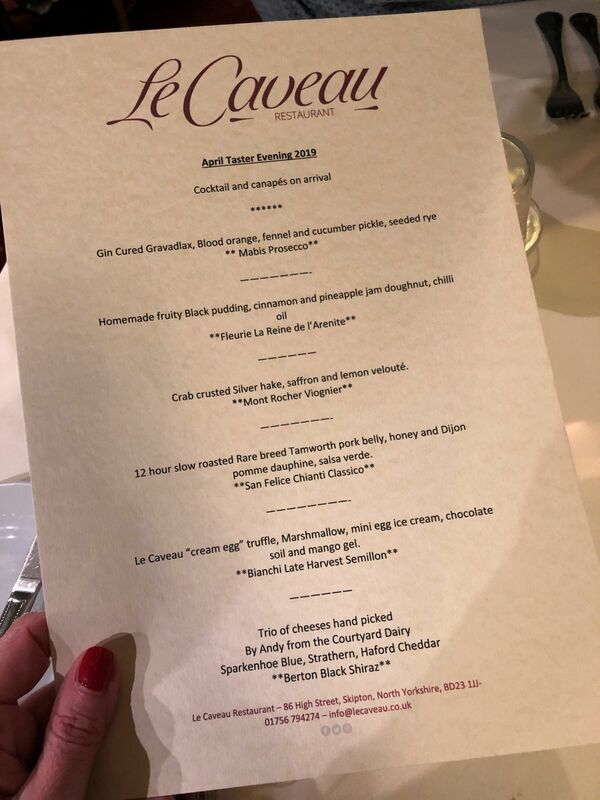 On that note, Mark is currently taking his annual two-week holiday with his wife and young family so Le Caveau is closed until the end of the month. Please, please do go and eat there for lunch or dinner if you live in Skipton or are visiting close by. 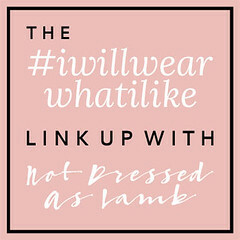 I guarantee you’ll love it as much as we do. Next Post Can You Feel The Love Tonight..?